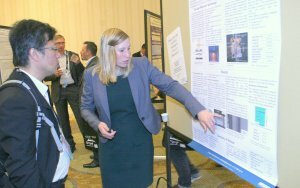 ORLANDO, FL, Nov. 10, 2014 — A new peer-review process for select presentations and a host of novel laser research expanded on the tradition and impact of 33rd installment of the Laser Institute of America’s flagship conference in San Diego on Oct. 19-23. The International Congress on Applications of Lasers & Electro-Optics (ICALEO®) featured 56 presentations given at least two reviews in a double-blind process, said returning General Chair Stefan Kaierle of Laser Zentrum Hanover. “We believe it was necessary… to change the way we present our work and especially to improve the quality.” About 35 to 40 papers will be published in a special edition of the Journal of Laser Applications, he said. ICALEO featured another smorgasbord of laser research and experimentation spanning the traditional and the novel — from 3D printing of human cells and killing malaria-carrying mosquitoes to powering a small flying craft and improving the dyeing and patterning of textiles. “We rare ly see a conference lasting more than three decades and still experiencing expansion,” said LIA President Yongfeng Lu in welcoming the more than 400 attendees from 30 countries. Opening the proceedings with the first plenary, Karsten Danzmann of the Max Planck Institute for Gravitational Physics discussed how lasers listen to colliding galaxies, white dwarfs (dead stars) and black holes. “We now have a large heritage of lasers that are flying,” he explained. “Neodymium YAG lasers are flying on many, many missions and will be flying on even more missions,” including the LISA Pathfinder scheduled for next year. Remote laser cutting to decommission nuclear facilities, especially Japan’s Fukushima, for which researchers examined the use of CW and pulsed 6 kW fiber lasers to cut steel and crush ceramic debris. Sessions on laser treatment of glass and sapphire, including crack-free marking and creation of shiny aesthetic effects by changing process parameters and marking angles. Power scaling of vertical and edge-emitting diode lasers to multi kW levels for applications like tailored NIR heating, selective laser melting, carbon fiber placement and pumping of solid-state lasers to facilitate laser cleaning or laser ignition of combustion engines. Power can be scaled, for instance, by producing arrays of 2,000 vertical emitters on one chip, then combining 56 chips. The resulting stack of 112,000 lasers emits 400 watts; combining 24 of those stacks can create a module with output around 10 kW. Renewable-energy applications, particularly the use of high-power lasers to increase solar absorption in photovoltaics. Cutting applications, including micromachining of sapphire with UV nanosecond lasers; direct cutting with diode lasers; and cutting of carbon fiber reinforced polymers with a 30 kW fiber laser. Experiments in the mid-infrared wavelength using a 120-watt, 2 micron thulium fiber laser. The novel research conducted with this well-established laser — originally intended for surgical applications — included examination of material absorption, thin-film ablation, polymer welding and even marking of produce like apples and bananas. Use of a picosecond laser to create bacteria-killing nanoparticles that are more effective than chemically produced nanoparticles and less toxic to endothelial cells than distilled water. Meantime, past LIA President Reinhart Poprawe, managing director of Fraunhofer ILT, received the Arthur L. Schawlow award at LIA’s annual awards luncheon and business meeting. 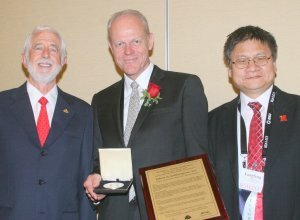 Outgoing president Lu handed the reins over to Robert Thomas of the U.S. Air Force Research Laboratory for 2015 and announced Lin Li as president-elect. First-time presenters Isaac Adebiyi of Tshwane University of Technology in Pretoria, South Africa, and Stephen Tate, a graduate research assistant at the Colorado School of Mines, found ICALEO to be a revelation. At the end of the conference, Kaierle announced Silke Pflueger of DirectPhotonics as Congress General Chair of ICALEO 2015, to be held Oct. 18-22 in Atlanta. Online versions of the ICALEO 2014 proceedings are available for $180 ($150 for members) at www.lia.org/store. For more information on ICALEO 2015, visit www.icaleo.org. The Laser Institute of America (LIA) is the professional society for laser applications and safety serving the industrial, educational, medical, research and government communities throughout the world since 1968. www.lia.org, 13501 Ingenuity Drive, Ste 128, Orlando, FL 32826, +1.407.380.1553.